All you need is a car and map to begin exploring Colorado’s scenic and historic byways. These scenic drives pass by several free attractions that provide opportunities to stretch your legs and learn more about Colorado history and landscape. For even more scenic drives, check out our quick guide to Colorado's 26 scenic byways. The Unaweep-Tabeguache byway has some serious “if only the canyon walls could talk” moments. From prehistoric giants to Spanish friars and 19th-century mining to WWII atomic weaponry, Unaweep has a captivating history. Just outside the town of Naturita in southwest Colorado is the Hanging Flume — an aqueduct system built to transport water in the late 1800s. 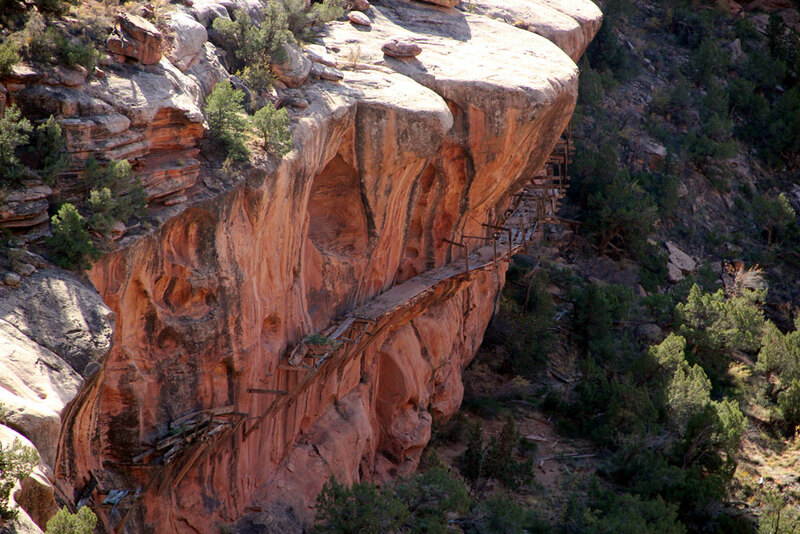 Remains cling to sheer canyon walls (pictured above) for visitors to peer into Colorado’s mining history and the engineering that helped create an enormous industry. Download the free self-guided tour at the Hanging Flume heritage website to play in the car while exploring area. The audio podcast has guided driving directions and interesting factoids compiled by historians, archaeologists and engineers. The Lariat Loop circles through rolling foothills, vivacious red-rock formations, fossil zones and historic mining towns — hard to believe, since the loop begins just minutes from downtown Denver. MillerCoors brewery tapped its first beer in 1873. Well over a century later, it’s now one of the largest breweries in the country and offers free tours. The tour features downtown Golden, the ins and outs of the brewery process and a tasting room (for the non-drivers in the car) with fresh seasonal brews. Colorado's Guanella Pass Scenic Byway is a great introduction to Colorado’s Rocky Mountains. Passing through the historic town of Georgetown, Guanella Pass is perfect for those wanting to recreate while exploring Colorado’s byways. The most popular way to experience Guanella’s breathtaking scenery is from atop Mount Bierstadt. Colorado has 58 fourteeners and Mount Bierstadt is one of the most accessible, making it the ideal peak for new climbers. Popular for hikes in the spring, summer and fall, make sure you arrive early and look over What is a 14er? : Colorado's Tallest Peaks for helpful hiking tips. Settlers of what now encompasses Colorado's Gold Belt Tour Scenic Byway had written “Pikes Peak or Bust” on the side of their wagons in the mid-1800s — a sign of their optimism for gold and the desperation they felt after crossing America’s challenging frontier. What a handful of them found in Cripple Creek, Victor and the hills surrounding these two towns ended up being Colorado’s biggest gold payload. Victor has a series of trails that lead to historic gold mine sites, downtown Victor and unobstructed views of the Sangre de Cristo Mountains. Each trail has informational displays explaining the area’s history and historic structures. Visit the Town of Victor’s website to pick trails that best fits your interest. The Santa Fe Trail Scenic Byway gives a glimpse at some of the first settlements during the height of the Santa Fe Trail era in the mid to late 1800s. History is the mantra for this byway as it passes through many National Historic Sites such as Bent’s Old Fort and downtown Trinidad. It also represents the first travelers to roam southeast Colorado: dinosaurs. Check out larger-than-life fossalized footprints in Comanche National Grassland. American Indians and pioneers peacefully joined together at the vibrant town of Boggsville in the mid-1800s. The former Santa Fe Trail trade stop traces the paths of Kit Carson and Wild Bill Hickok and hosts Old West reenactments during the summer months. Photo: Hanging Flume, copyright flickr/kahunapulej.